What is the full cost of youth incarceration? Did you know the State of South Carolina spends as much as $155,490 annually to incarcerate a young person? This is in addition to the estimated billions of dollars in long-term costs created by the excessive use of youth confinement, including reduced income levels, lower tax revenue, greater reliance on public assistance, higher costs to future crime victims, and increased rates of recidivism. According to the Justice Policy Institute, such long-term costs can reach as high as $8 billion to $21 billion per year nationally. According to the US Census, South Carolina only spent $9,147 per child on education in 2012. Where would you rather invest your tax dollars? South Carolina’s “School-to-Prison” pipeline is all the policies and practices that push children out of school and into the juvenile or criminal justice systems. 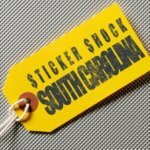 SC Appleseed is teaming up with the Give Kids a Chance Coalition this week to educate the people of South Carolina about the real costs of the school-to-prison pipeline and call on policymakers to recognize the enormous costs in our juvenile justice system for youth incarceration and work to alleviate them. For more information on how this “School-to-prison” pipeline operates in South Carolina, check out our infographic.